You may or may not have noticed that my postings this summer have been sporadic. Well I am getting back on track. Anything else that was added to these days would throw me over the edge and it was common to have to include other things like packing for camping or vet appointments for Islay. Our summers have been busy before, but this seemed so much more so. Now that Jack is back in school and Will starts full classes on Wednesday, I am hoping to get my schedule back in order too. 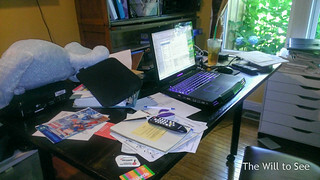 I have a really messy office that needs to be organized and a bunch of writing to do. Look for some great posts coming up this fall. Paperwork all over the kitchen at my house, too.